he was too busy protecting the fire dept. after all he was wearing a fd jacket during the conference.it seems to me that the first fire company there should have taken action immediately when they notice the gas smell. along with the contractor and the fire department and gas company are all three to blame. Thanks, Jack. I wasn’t aware that Sly was wearing a FD jacket until I culled the photo from the Internet. A suit would have been more appropriate. Cute Ad on green, but selling out to Clorox?? What’s up with that? Regards your analysis of responsible parties on JJ’s, I could not agree with you more how these parties are passing the buck. Absolutely, they should have shut the restaurant down on smell of gas. There needs to be strict standards in place that MGE and all utility companies need to follow when digging. We need solutions, not lip service!! I am infuriated about this because one of the severely injured has family relations to us, and now he is critical in KU Burn Unit, facing months of healing and help. Also, no one is talking about the workers there, with no hope of financial assistance. They have families to support, and we all know restaurant workers live on tips and goodwill. To that extent, some folks are organizing some fundraising efforts to help these folks. Would appreciate your help in promoting this on your blog, as details become clear on the fundraising event. Let me know about the fundraising efforts, Bob; I’ll be happy to help promote. You are absolutely right! Way too much time before evacuations were ordered. Such a tragedy and made so much worse if it didn’t have to happen. The Kansas City Star reporters, editors and photographers did an incredible job getting so many stories on a very challenging deadline. Am sure they would have been happy to substitute their outstanding effort for not having to cover a tragedy at all, if only it could have been avoided. That’s the kind of story reporters really dread, as you know, Laura. It’s a huge story, but you know the pain that’s involved, and it can be hard to stay focused on the circumstances. So disturbing on so many levels, not the least of which is why, with an overwhelming odor of natural gas, did restaurant patrons sit and sip wine? It seems wrong to point fingers in the shadow of such a preventable tragedy, but in this era of “I’ll take care of myself, thank you very much,” why didn’t everyone in the area leave first and then everyone call 911? We’re all culpable on this one. I keep asking myself if I would have just sat there in the stink with my wife waiting for someone to tell me what to do just because. My regret now is that your excellent interpretation of the failures will be limited to the reach of your blog. I’m sure your good newspaper cronies will give it some wider distribution. Don’t worry about the explosion and its aftermath being muted. While COB tomorrow may be early for the first briefs to be filed, Monday afternoon certainly is not; one expects a virtual blizzard of them. Add in the focused gaze of Suaron /a> and Marisa Coulter’s ground troops scouring the city for every juicy informational morsel and James’ wrong-headed defensive posture makes a little more sense. J.J.’s has the potential not only to define the Mayor’s term, but to limit it to a single-o. I think you are being too hard on the mayor. He was telling the truth as he saw it and dealing with a very difficult situtation. I thought his response was appropriate. The mayor tried to bully the press; that’s not going to work. White’s reply reflects his “elected person” view of life. He’s wrong. I just learned something else…The fiber-optic cable that Heartland Midwest was working on apparently was destined for the Plaza Vista project across the street — the project that has bedeviled JJ’s and other area businesses for about a decade…Just an ironic post script. Obvious mistakes were made after the fact…BUT IT IS A “NO-BRAINER,” and fatal mistake, not to shut off the gas! Would you work on “hot” power lines? Ask the IBEW and KC&L! That from a guy with many years’ experience with wires, cables and utility lines. I thought it was interesting that Mayor James (wearing a KCFD shirt) interjected statements during the KCFD portion of the news briefing, yesterday. But then it became was obvious why James did this: Even my 12-year-old daughter thought Chief Berardi sounded like a stammering idiot, complete with a deer-in-the-headlights look. He said “uhh” more than he said anything else, beyond fumbling through a buck-pass to MGE. Sly James seemed more frustrated than defensive, and who can blame him? He was bailing out his fire chief AND trying to save the city’s face. This business of fire personnel deferring to the gas company regarding an evident hazard is ridiculous. Firefighters are trained not only to recognize a hazard, but to act on it for the safety AND health of those present, and this goes beyond an explosion risk. If people were getting sick from inhaling gas, they needed to be moved from the area immediately. Gas is toxic and can be lethal if patients aren’t moved from the area ASAP. Even if MGE apparently told the responding fire company that everything was “under control”, as has been reported, fire personnel would certainly have recognized that there was indeed at least one hazard. That must be awful for rescuers, trapped between knowing what they should be doing (and stepping on toes if they do it, anyway), and following a policy that makes no sense. Some of these policies are state and federal guidelines, so the potential for a more massive problem is disquieting. Let’s hope that as the investigations come together, this situation might shake loose all this organizational rust that seems to have prevented involved agencies from doing what they’re best at. If public safety personnel recognize a hazard, they shouldn’t need to play ‘Mother May I’ with a utility company that insists “there’s nothing to see here, we’re fixing the problem and the problem’s really not that bad.” I’m hoping the KC Star sheds more light on this and can help expose a problem that NEEDS to be fixed before another situation like this happens. That’s an astute and well-written assessment, Allison. I didn’t see the news conference or even see any clips later, but, from what you say, it sounds like Berardi might not have much experience in the public eye. I’m sure that’s the way it is with a lot of chiefs, but it seems to me it would be good to get your higher-level officers some p.r. experience before elevating one of them to the top job. If there is one reporter at The Star I have confidence in, it is Steve Everly. He’s absolutely a journalistic super star writing in an area most people seldom read about. This should be very interesting as long as The Star doesn’t back down. PS: Thanks for caring about this, Fitz. I feel better that we’ll get to the bottom of this knowing that you’re pissed off about it. Thanks, John. I hope this column/commentary does help to push the ball forward…I can assure you The Star will not back down. This is the kind of situation where the editors and reporters grit their teeth and plow ahead. They will not allow the mayor or moneyed interests to play them for fools. I would bet, without any inside information, that McGraw and Thomas — and maybe one or two more reporters — have been turned loose to put this under their microscopes and assess each and every player who had a role in the debacle. Good post Jim! Time to hold some feet to the fire and end this game of hot-potato now! If Sly won’t do it, then you and The Star must. I was thinking of you and your background as a contractor when I mulled that question, because I had been thinking the same thing. Four words come to mind; common sense and personal responsibility. Why anyone with an IQ above 70 would not have gotten the hell out of the area with the pungent smell of gas in the air is a mystery to me? Public education? Darwinism still at work? I don’t need KCFD, KCPD, MGE or EIEIO to tell me when a situation is hazardous. Putting blind faith in anyone other than yourself will more often than not get you killed. Sly James is a bully. He makes Drew Peterson look like Jimmy Kimmel. He is a disgrace to the bar and to public service. Unfortunately, his skin color affords him the same type of analytical neglect as our Dear Leader from commie libs in our local media circus. 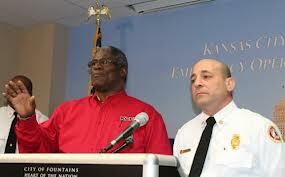 The lack of action by KCFD and MGE is criminal in my opinion. Heads should roll and with the Grace of God by Jimmy’s sword. Smartman — You know how I hate it when you lay into our nation’s “Dear Leader,” but, by God, when you talk about JimmyC wielding a sword, it makes me puff up a bit. Thanks, buddy! Excellent post. Remember James also said (paraphrasing) that sometimes it’s not wise to evacuate whole blocks…. you might want to rethink that statement Mayor because that’s EXACTLY what you do. NO ONE should have been killed or injured because no one should have been around. Thanks, David…I would think you would evacuate at least as far as the smell of gas is pronounced — which probably would be at least the immediate block, in every direction. One point on the the firefighters deferring to MGE. Fire departments in large cities often rely on the business/utility for instruction in these cases. When there is a refinery fire, the fire department follows the lead of the companies first responders. They are better trained in the techniques used in their industry than fire departments. They know the layout, the locations of shutoff valves and have experience in fighting these fires themselves. I worked at a R&D facility for a major oil company. If we had an incident and the local fire company responded, they worked under the direction of the company’s fire & safety group. Not a vindication of how the fire department handled the situation, rather a SOP which went horribly wrong. Good information, Orphan. Some changes might need to be made in the SOP…As I said in the post, the fire department — with all its employees on the public payroll — is the agency that is most accountable to the public in a situation like that. They are the people I would expect to act first in the interests of public safety. A battalion chief should be able to say to the gas worker “Hey, you may have this under control, but we’re going to evacuate the area, just in case….” Those bat chiefs have hats as big as the Pope’s; they command respect; I don’t see them taking a back seat to anybody. Great post Fitz. Really interesting. is that they send out folks who know where the phone, electrical and gas lines are BEFORE you dig. This is obvious info, but if you are not involved in, or have a tangential working relationship by way of your profession, it is important info. The little flags you see in people’s back yards and along the sides of city roads are placed there by these folks. I am outta my pay grade a little here, but this is the first expectation of any professional in any trade, when there is digging to be done. Allison’s post is excellent, but it brings up an interesting point, which will no doubt be made time and again in the coming tsunami of litigation. (Mike White is now FINISHED commenting on this matter for professional reasons, I would think.) I saw a comment yesterday which had the ring of authenticity to it, by way of wording. It sounded like a protocol out of a manual. Essentially, it absolved the Fire Dept of responsibility and quoted the hierarchy of responsibility which, in this situation, rested on the shoulders of MGE by virtue of equipment THEY possess, which delineates categorically the danger from gas, which can be accurately measured by that same equipment. In other words, the gauges the MGE folks have supersede the guesswork that is inherently involved in just smelling gas. I notice the comments that are in line with mine about shutting off the gas. Like everyone else, I was watching events unfold on TV, screaming, “Shut off the fu*kin’ gas!! !” in my inimitable, low-key, carefully considered way, while the fire from the gas just kept burning. I am picturing a big valve placed somewhere in line with gas mains in that area and a guy with a hard hat, looking at a schematic and then rushing to kill the gas. The next day, on TV, I see a backhoe pounding away in the middle of the street, breaking up the pavement, in order to access just such a point. Once again, I am way outta my pay grade, but what the hell?!!? To shut off an area from dangerous chemicals we gotta take hours to tear up the street? The mayor’s close association with the Fire Dept is no secret and no mystery. Just for the record, I like Mike White. I’ve been waiting for you to comment, Chuck, and, as usual, you didn’t disappoint…One of my regular readers told me today (when I stopped by his house on an errand) that, in my post, I said what everyone was thinking. Obviously, you were thinking along the same lines. The situation on 48th Street last Tuesday called for a lot more people to heed your “low-key, carefully considered” line of thought: Shut off the gas and evacuate! P.S. Mike is a great guy, and I understand how he’s thinking on his point about the mayor. But the mayor was simply too defensive. We already had the fire department let us down…The last thing we needed was for the mayor to get defensive. I understand what he said, but for those folks who want to know the details, in order to understand the events, I think he should address the situation in more detail. Why is the backhoe, the next day, on live TV trying to access a valve (?) to kill the gas that is still emanating from the hole in the ground, if what Mark says is true? Chuck, I agree with your points about my statement being somewhat confusing to the lay person/public. I wanted to point out; I explained it in length and extensively about what should be available to shut down a gas leak of this magnitude with no control over the leak, especially in a congested, downtown area right next to a building. The reporters-editors decide what to write, and to what extent they decide makes enough sense to the average reader. Space in the newspaper is a premium. Keep in mind, when something like this happens, the media is full of questions without many answers. When asked, I try to educate the reporter on the technical basics of natural gas and what I believe are the possibilities based on dozens of other gas explosions around the nation. My overall goal is to ensure that information that is as accurate as possible gets out to the public — sooner than a year or so from now (after the public has long forgotten about the explosion and death) when the PSC (Missouri Public Service Commission) releases its final report of its findings. Questions need to be asked and answered soon after the explosion. The public and the loved ones of those lost & injured deserve at least that. By the way, the gas can’t be shut off if the leak is before the valve, & even if they closed the main line, blocks away, it would have still been filled with pressurized natural gas, which would have continued leaking through the rupture. Your witch hunt has little logic. Not the “blame game” but what I already commented on. It’s quite clear to me you work for a gas company, maybe even MG&E? As far as the valve “blocks away”. On a 50-lb gas line, you’re correct on line pack when the valve is shut down. However, it will immediately start to draw down, especially in the winter with all the heating appliances still calling for gas. And…we ALWAYS would find a meter on the valve shutdown and vent the “packed” gas down much quicker. If you read the state & federal regulations, it does state the location of such valves shall be positioned for a shutdown in case of an emergency, and it also states the “pressure” is one of the things to be considered when spacing these valves. If it’s blocks away from the leak and you’re right about line pack…it sounds like the company may not have placed the valve correctly in terms of safely shutting down a high pressure system? The other factor here is Main valves used be located at the end of each street (or every few blocks on longer streets) in the past, and maintained. IN MY OPINION…since de-regulation the gas companies have reduced their staffing by over 20%, while gas customers have grown by more than 20%. The companies looking to cut back on costs could not maintain the Main valves, nor were they directly required to by regulation, So, they were often paved over and not installed in newer installations. Sounds like many more should be worried if a break in the main in front of their home/work were to happen, since this gas cannot be controlled! The PSC does take an extra step on the federal regulation requiring critical Valves be spaced so that a shutdown can be re-lit within eight hours. Based on this incident and some comments here….it needs to go much further, especially on high pressure gas. Since it sounds like the company can’t control their own gas when it leaks. Jeff, I havn’t seen a time line yet that is or has been accepted by the authorities in question and the media. I think that will be forthcoming and because of the high profile nature of the event, will be accurate. At this point, based on conversation and comments, it looks like we can establish this much. The standard equipment carried by MGE is the MSA 260. This unit detects gas and runs less than $1000.00 (I find them on line for way less.). It has not been established to morons in the street like me, if the KCFD carries them also. Typically, a multi-gas detector is used (LEL, CO, O2, and H2) because those are the most common hazards found in confined space entry (tanks, vessels, sewers). With regard to the MSA 260–Is that the standard for on site determination of danger with relation to gas? Does the Fire Dept have them? Does MGE have them? Are there better units that MGE carries that would over rule a reading of an MSA 260? Who carries those? Is there a precedent or hierarchy for responsibility with concern to protocols in similar situations? These facts, for observers are yet to be established. Here is an explanation of hierarchy responsibility by a commenter, and it rings true to me at this point. “The fire Department shows up, gets an on scene briefing by anyone having relevant information, and then directs the response. In your scenario, he would have heard from the boring contractor (yes, I hit a line in the alley. I had about 75 feet of my reel out heading north, i hit an obstruction, pushed through it, and began smelling gas, alled 911 right away) and then from MGE (LEL readings elevated in the alley. Gas may be migrating into surrounding structures.) There would have been a discussion of where the shut offs were (e.g. does MGE know where they are, etc). At this point, it seems that the the blame is going to fall on the KCFD, not so much because they could have prevented the explosion, but the fact that it looks like they abandoned thier post. In addition, it seems at this point, to me, that the KCFD is in control and is the final word on what actions to take in these situations. The thing that stands out to me, is the testimony of many whom were with in close proximity who smelled an overpowering stench of natural gas, in juxtaposition with the fact-that we KNOW the KCFD was on site and left while this smell still existed (WAS AN MSA 260 EMPLOYED?). There is a dramatic difference of opinion to this point on the ability to shut down gas valves. Apparantly you can shut down “Curb” valves close to business’ but NEVER a main valve. This must be what Mark McDonald was referring to and, is and will be a crucial piece of information (Was it done/ Who did it? When was it done? etc) in the coming weeks. No matter what your opinion of the KCFD and MGE’s performance, I can’t believe that these two companies thought there was any real danger, or they don’t leave. Or do they? A shift in the wind? No MSA 260 on the trucks. Do we have the right time line yet? Jeff, it doesn’t look like there is a time line established and that, along with assessment of other variables in conjunction with the actions of the relavent personell will determine who hangs and who pays. People will hang, and money will be paid. Lets hope the lawyers get it right and the victims can move on. Here are some URL given to me by folks a lot smarter than I am. In true “do unto others” fashion I ask this question of the on site KCFD and MGE employees. If your family members or loved ones were inside JJ’s would you have ordered them to evacuate immediately? First and foremost we are all instructed to be our brothers and sisters keeper. Forget what the earthly judge and jury might say. What would Jesus do? Keep in mind that I am partial to Old Testament Jesus and his cruel and unusual brand of smiting, a position I will most likely be negotiating on my Judgement Day. Excellent point, Smartman…The answer to your question, of course, is that fire fighters or gas energy workers would have had any relatives out of JJ’s seconds after smelling gas. …I like your chances of negotiating with The Big One. Just keep your wits about you and keep talking reasonably…Don’t get into the political stuff, OK?